Originally published under the title "Ready for the Storm: Israel Ensuring Syrian Conflict Doesn't Spill into Its Borders." 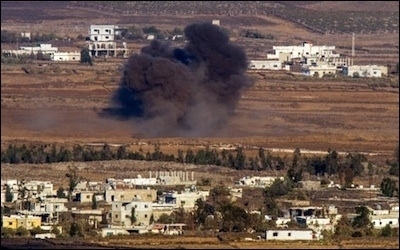 The fragile cease-fire declared in Syria on February 27 between regime and rebel forces is in the process of crumbling. Assad's forces have launched an offensive across southern Aleppo province. Fighting is also taking place in Homs and northwest Hama provinces and east of Damascus. There are reports of regime forces massing for an assault on rebel-controlled eastern Aleppo city. The cease-fire, in any case, applied to only one of the many conflicts taking place in Syria. It did not extend to the war between Islamic State (IS, ISIS) and the Western-supported, Kurdish-dominated Syrian Democratic Forces. It did not include the fight between Islamic State and other rebel and Sunni Islamist groups. Nor did it apply to the intermittent fighting between the Kurdish YPG and the rebels, or the Kurds and the regime. From Israel's point of view, the resumption of hostilities in Syria will come as no surprise. Nor will it change the basic Israeli calculus regarding events in Syria. IDF artillery prepare to return fire following a Hezbollah attack that killed two soldiers along the Israel-Lebanon border in January 2015. Prime Minister Benjamin Netanyahu this week for the first time acknowledged openly that Israel has engaged in air action to interdict the transfer of sophisticated weapons systems from Syrian soil to Hezbollah in Lebanon. "We act when we need to act, including here, across the border, with dozens of strikes meant to prevent Hezbollah from obtaining game-changing weaponry," Netanyahu said during a visit to military units on the Golan Heights. Action of this kind has been widely reported in global media. The prime minister's confirmation will thus surprise few Syria watchers in terms of its content. But Netanyahu's decision to openly admit this action nevertheless represents a departure from the usual Israeli practice with regard to Syria. Israel sees the Iran-led regional bloc as a greater strategic threat than Sunni jihadis in Syria. This does not mean that Israel is indifferent to the potential threat represented by the flourishing of Sunni jihadi forces, including Islamic State, close to the border. But because of the higher level of organization and far more sophisticated capabilities of the Iran-supported elements, preventing their advance is considered paramount. This view also informs Israel's other area of vital concern regarding Syria – namely, the question of which forces are located immediately east of Quneitra crossing, facing the Israeli-controlled part of the Golan Heights; and no less importantly, who controls the area of Deraa province facing Jordan. At present, the map of clashing forces in this area is complex. In terms of who controls what, the non-Islamic State rebels control the greater part of the area immediately adjoining the Israeli-controlled Golan. But both the regime and Islamic State are also present in the area. Regime forces control a small enclave at the northern edge of the borderline around the town of Beit Jinn. Further south, regime-supporting forces control the Druse village of Khader, just east of Quneitra. An Islamic State franchise, the Shuhada al-Yarmuk (Yarmuk Martyrs') Brigade, meanwhile, holds an area at the southern edge of the borderline, from the town of Tasil down to the Jordanian border. Against the background of the cease-fire between the rebels and the regime, fighting between Islamic State and the rebels is taking place east of the border with Israel. Shuhada al-Yarmuk is being supported by an additional jihadi militia, Harakat al-Muthanna, which has yet to formally align itself with Islamic State. On the rebel side, both Jabhat al-Nusra and Ahrar al-Sham, powerful jihadi militias, are present. Fighting Islamic State alongside them are the Western- and Jordanian- supported forces of the Southern Front. What is the nature of the Iranian threat here? 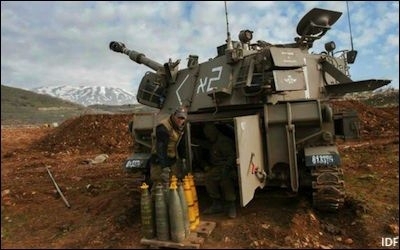 First and most obviously, Israeli officials consider that Iran and its allies wish to establish a second platform, in addition to the Israel-Lebanon border, from which strikes could be launched against Israeli communities. But an additional consideration exists. The Iranians want to foment renewed insurgency in the West Bank against Israel. Achieving a capacity to transfer weapons to that area via Jordan forms an essential element of that strategy. In turn, controlling the area adjoining the Syrian- Jordanian border in Deraa province is crucial for the realization of this plan. This reflects the interconnectedness of events in the region, but also the overriding Israeli interest, of which all these elements form a part. Namely, the determination to keep the military, political and ideological storms that are consuming all before them in the surrounding area from spreading into Israel itself.